It's said in Hollywood that even the guy bringing you coffee is working on a screenplay, and that's not too far from the truth. In an industry that thrives on new ideas, people are lining up outside the gates to provide them - and working at the coffee shop while they wait to be discovered. It's also said that the game industry is a fair model of Hollywood in most respects, and in this respect, the model holds. An informal poll conducted by this author at a recent game industry conference confirmed that a good 80 percent of all attendees - developers, press and others - had a game design idea up their sleeves and were drawn, like starlets on the Greyhound from Nowhereville, to the place where the action is. 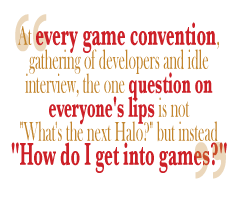 At every game convention, gathering of developers and idle interview, the one question on everyone's lips is not "What's the next Halo?" but instead "How do I get into games?" The answer depends on who you talk to, but no one - not even the big shots - can rule out the lucky break. "I had no idea there was a program an editor used to create the game - I thought a game just got created," Ken Levine, Lead Designer of BioShock recently told 1UP. "I didn't know anything. And probably based on the fact that they were in awe that I had lunch in Hollywood a few times, [Looking Glass] hired me." Levine, frustrated by his efforts to get a screenplay produced in Hollywood (and unwilling, I assume, to work at Starbucks), instead took his efforts into the game arena, and the rest is chart-topping history. But not all designers are as lucky as Levine, and the larger the industry gets, the more body guards are at the gates, and the harder it is to get lucky. Ballooning budgets and expanding production cycles have brought Hollywood-like bureaucracy to the once idyllic game industry, and getting in isn't any longer as easy as stepping off the bus and looking pretty (or smart). "The best way to begin your trek is to start in another department, such as quality assurance, customer service or technical support," says Ryan Shwayder of 38 Studios. "It's generally not too difficult to get your first job in one of these departments." But working up from the mail room isn't for everyone, and even for those willing to sling support tickets for their AAA masters, it'd still be nice to find a place where everybody knows your game's name. Enter: the casual space.